Alaska’s woodchucks are the same species as eastern “groundhogs,” the famed predictors of spring. The woodchuck is one of three marmot species that lives in Alaska. It is a large rodent in the squirrel family weighing between two and nine pounds (1–4 kg) and may grow to be 26 inches (67.5 cm) long. The animals attain their maximum weight in late summer, when they accumulate thick layers of fat that will sustain them through winter hibernation. Body shape is similar to the hoary and Alaska marmots with their head short and broad, legs short, ears small, body thickset, tail densely furred, and front paws clawed for digging burrows. A uniform reddish brown, the woodchuck has an unmarked brown face. The name woodchuck originated as a Cree Indian word used to describe a number of similar-sized animals and does not describe characteristics of the woodchuck's behavior or habitat preference. The woodchuck is the most solitary of the marmots, and lives alone except during breeding season, in contrast with the highly sociable Alaska and hoary marmots. The alarm call of the woodchuck is a loud whistle. They also hiss, squeal, growl, and yip. In areas where marmots are hunted by humans, they may have learned to remain quiet when humans approach. Good climbers and swimmers, woodchucks may also take to trees or water to avoid predators. Woodchucks demonstrate a mating system similar to that of other ground-dwelling sciurids, particularly ground squirrels and prairie dogs in which both males and females mate with multiple partners. In Alaska, all marmots mate in April or May. About a month later, two to six young are born hairless and blind. Young woodchucks emerge from their dens at about 5 weeks and disperse two months after birth. They may breed for the first time when they are 1 year old. 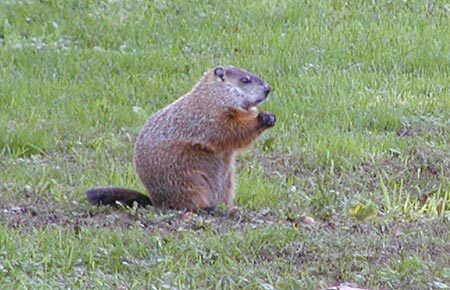 Woodchucks are largely herbivorous and eat grasses, flowering plants, berries, roots, mosses, and lichen. True hibernators, woodchucks enter a state of torpor in winter during which body temperature and all bodily functions are reduced. Woodchucks hibernate alone in the same burrows in which they spent the summer. To protect themselves from the cold, they plug the tunnel leading to the nest chamber with a mixture of dirt, vegetation, and feces. They emerge from their winter hibernation in April or early May to find food and mates. Body size of the marmot fluctuates during the year because of hibernation. A woodchuck leaves its winter sleep very thin but quickly gains weight, with fat stored for hibernation making up 20 percent of its body weight at the end of summer. Woodchucks are found in east-central Alaska, and the Yukon Territory. They seem to prefer open grassy areas with good drainage, and open deciduous forest with grass, forbs, and shrubs for undergrowth. Human development also creates good habitat for woodchucks by clearing land for parks, crops, and gardens. 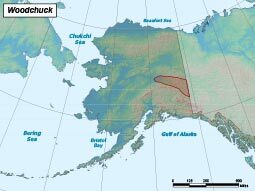 Woodchuck dens may be up to 30 feet long, are dug in the loamy soils of river valleys in Interior Alaska, and end with a chamber containing a large grass nest. Most marmot dens have a main entrance with a mound of dirt near the hole and a number of concealed entrances. Marmots are social animals. Although each family has a separate burrow, these burrows are located near each other, forming a colony. Marmota monax maintains a stable population trend. Grasses, flowering plants, berries, roots, mosses, and lichen. Occasionally snails, insects, eggs and small birds. Mating occurs once per year in early spring. Females give birth to litters of 2-6 young in late spring to early summer.